This herbaceous cigar is typical of the H.Upmann brand. Gentle tobacco aromas guide you through this well balanced Corona, allowing you time to enjoy every draw. 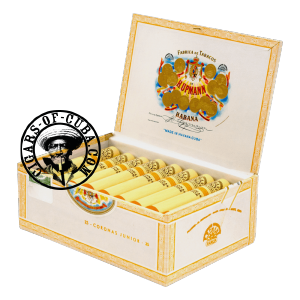 Same size as Fonseca Cadetes and Upmann Petit Upmann, delivered in the new aluminum beige tubes. Delivered in the new aluminum beige tubes. Great starter smoke for a novice. Sweet toasted/herbaceous aromas for such a tiny Cuban cigar. A good introduction to the Upmann aromas. Once finished you can move onto a bigger brother.